Use of thorium instead of uranium may be breakthrough in energy production. Recently, India has announced their intent to produce nuclear power using thorium. The thorium reactor under development would be the first of its kind. The development of workable, industrial-scale thorium reactors has for decades been a dream for nuclear engineers and environmentalists alike with the hope that it becomes a major alternative to fossil fuels. Thorium has considerable advantages over uranium. Thorium is more abundant and using it does not involve releasing large quantities of carbon dioxide, making it less harmful to the climate than fossil fuels. The Bhabha Atomic Research Center (BARC) in Mumbai is finalizing the site for construction of a new large-scale experimental reactor. If all goes according to plan, the reactor could be operational by the end of the decade. The reactor is designed to produce 300 megawatts of electricity—about one fourth of the output of a typical nuclear plant. Producing a workable thorium reactor would be a huge breakthrough in energy production. Using thorium—a moderately radioactive element named after Thor, the Norse god of thunder—as a source for nuclear power is not new technology. Early research carried out in the U.S. during the 1950s and 60s was promising, but abandoned in favor of using uranium. Some believe this is at least partly because nuclear power programs in developed countries produce plutonium as a byproduct which can be used to create nuclear weapons. Unlike uranium, thorium reactors do not produce plutonium. Also, the waste from thorium reactors is less dangerous and remains radioactive for hundreds rather than thousands of years. For governments worried about nuclear waste and the possibility of terrorists getting their hands on plutonium, this is a distinct advantage. Another reason for the attention on thorium is that the world’s supply of uranium is being rapidly depleted. Thorium is more than three times as abundant and contains 200 times as much energy density compared to uranium. India has the largest thorium deposits in the world, nearly 40% of the world’s supply, giving them additional incentive to develop the technology for export. 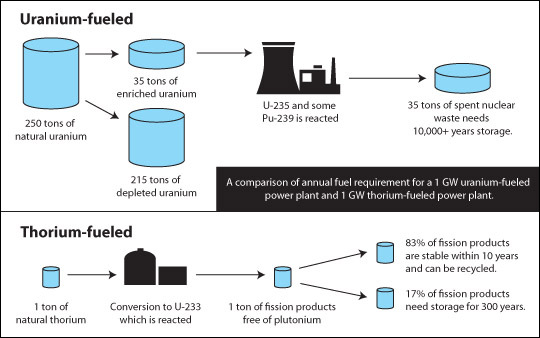 One potential problem is that thorium reactors need a trigger fuel to initiate operation. Usually plutonium is used as a trigger fuel, but that could pose a problem for import and export. New reactors will eventually be developed to use low-enriched uranium as a trigger fuel which will make it much easier to market the technology abroad. Great Post! I was enjoy in this post.